Cut out some segments of the paper strip and assemble them into a valid sudoku square. People often amuse themselves by looking for some specific sequences of decimal digits in π. For example, Mikey was born on 1992-06-05, so he was pleased to note that the sequence “9265” does indeed appear in π: its first occurrence starts with the fifth decimal digit of π. We say that “9265” occurs at offset 5. It is often claimed that one can find everything somewhere in π, including the collected works of Shakespeare. However, this is actually still an open problem. Basically, we only know is that the short substrings seem to have a roughly-uniform distribution in the known prefix of π. By the time Mikey printed the first 13, 000, 000, 000 digits of π, he already saw each of the 9! possible substrings at least once. (On average, he saw each of them roughly 13 times.) The last permutation of 1-9 to appear was “631279485”. The first offset in π where you can find this particular substring is 12, 944, 969, 369. 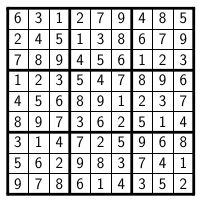 A sudoku square is a 9 × 9 square of digits. Each row, each column, and each of the nine highlighted 3 × 3 blocks of a sudoku square must contain each of the digits 1 through 9 exactly once. One valid sudoku square is shown in the following figure. In each subproblem your goal is the same: you have to choose 9 substrings of π and arrange them into rows of a grid in such a way that the resulting grid becomes a valid sudoku square. In the easy subproblem F1 you can use the first 250, 000, 000 decimal digits of π. Any valid solution will be accepted. In the hard subproblem F2 you must use a prefix of π that is as short as possible. That is, if we look at the offsets of the substrings you chose, the largest of those 9 offsets must be as small as possible. Any such solution will be accepted. The output file must contain exactly nine lines. Each line must have the form “string offset”, where “string” is a permutation of 1 through 9 and “offset” is a valid offset into π where this particular string of digits occurs. The strings must form a valid sudoku square, in the order in which they appear in your output file. The offsets must be small enough (as specified above). Below is a syntactically correct example of an output file you might submit.